During August I spent some time investigating the spelling of Valentin Zeglovsky’s name and posted some results under the title ‘Valentin Zeglovsky: some Australian notes’. It was a somewhat esoteric exercise but it did yield other information about Zeglovsky, of which I was not previously aware. So for me it was a worthwhile excursion, although it did envelop Zeglovsky in further mystery. I mentioned in the previous post that Zeglovsky completed the various procedures to become a permanent resident in Australia and to acquire the status of a British subject. One document that was part of that process contains a short but closely packed, typewritten section entitled ‘General Remarks’. The document, dated 11 December 1945, was typed not by Zeglovsky but by a public servant from information provided by Zeglovsky. Under ‘General Remarks’ the document states, in part: ‘Applicant states that his birthplace is Riga Latvia not Kharkov as per Declaration. Passport verified this statement’. This is interesting because in his autobiography, Ballet Crusade, Zeglovsky records that he was born on 26 July 1908 in Kharkov. Zeglovsky’s account of his life from birth to the early 1940s was published by Reed & Harris as Valentin Zeglovsky’s Ballet Crusade in December 1943 with a reprint in 1944. Ballet Crusade‘s title page (at least for the 1944 reprint) says ‘translated from the Russian’, although no acknowledgement of the translator is given. However, letters from Valrene Tweedie written in the 1940s from Cuba to her friend in Sydney, Marnie Martin, indicate that Martin had been working with Zeglovsky on a book, which Tweedie confirmed before her death in 2008 was Ballet Crusade. Martin had been an extra during the Ballets Russes visits to Australia and remained a lifelong friend of Tweedie. From the letters it appears she was quite close to Zeglovsky — Tweedie frequently ends her letters to Martin with a greeting to ‘Valentin’ as well. It was also Martin’s GPO box address that Zeglovsky used on most of his applications to the patent’s office mentioned in my earlier post. I have no evidence that Martin was a Russian speaker but I suspect that ‘translated from the Russian’ may have been a euphemistic way of indicating that the book owed much to Martin. Tweedie maintained in fact that it was ghost written, at least in part, by Martin. Tamara Finch in her autobiography, Dancing into the unknown, records the initial efforts by those Ballets Russes artists who remained in Australia in 1939 at the conclusion of the Covent Garden Russian Ballet tour to find work for themselves in Australia. Her account explains that a small company, which included Zeglovsky, formed to give recitals but disbanded in 1940 after the venture proved unsuccessful. It was probably around this time that Zeglovsky settled in Sydney and began teaching and dancing with various companies. The ‘General Remarks’ on his naturalisation application state: ‘At the outbreak of war applicant under engagement to J. C. Williamson and travel led all over the Commonwealth’. Briefly, Zeglovsky danced and travelled with the Kirsova Ballet and danced some seasons with the Borovansky Ballet. In 1942–1943 he also performed in the J. C. Williamson revival of the popular musical White Horse Inn, which opened in Sydney in December 1942. This aspect of Zeglovsky’s Australian career will be the subject of another post. However his naturalisation papers reveal that he also worked in decidely non-dancing jobs. The same ‘General Remarks’ mentioned above record: ‘Late in 1943 commenced work as a cement worker at the Captain Cook Graving Dock, Sydney’. And a little further on: ‘Applicant states that he is a fully qualified diamond tool setter’. On immigration documents relating to Zeglovky’s arrival in Australia with the Covent Garden Russian Ballet in 1938, he lists his status as married and his wife’s name is given as Mia. Later documents completed by Zeglovsky and held in the National Archives of Australia indicate that Mia was born in 1910 in Riga and that she was living in Tel Aviv, Palestine, when Zeglovsky applied for naturalisation. Mia Arbatova is mentioned on several occasions in Ballet Crusade and, although in the 1940s Zeglovsky continues to state that he is married, sources such as the Jewish Women’s Archive indicate that Arbatova and Zeglovsky, who were dance partners and who are said to have married in 1933, divorced in 1937. Zeglovsky married dancer Pamela Nell Bromley-Smith in Sydney in 1949 according to the New South Wales Registry of Births, Deaths and Marriages. Bromley-Smith appeared as the Daughter in La Concurrence with the Covent Garden Russian Ballet in its Sydney season in December 1938. Her name appears on a program dated 17 December 1938 and a photograph (not in costume for La Concurrence but in an exotic two piece fringed and beaded costume) appeared in the Evening Post from Wellington, New Zealand, on 6 February 1939 with the caption ‘Pamela Bromley-Smith, aged 10 years, who was engaged in Sydney to dance the child role in “La Convenience” [sic], a performance by the Russian Ballet. Pamela is from the Dolee Brooks School of Dancing and holds her intermediate dancer’s diploma for operatic dancing in Australia …’. The performing arts gateway AusStage records that she appeared in a number of productions at the Minerva and Independent Theatres in Sydney in the 1940s. Ziggy, as he was apparently known in the Ballets Russes, continues to fascinate! 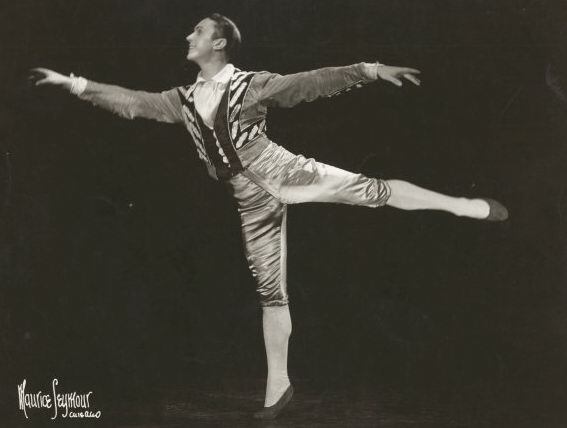 Featured image: Zeglovsky in Cimarosiana reproduced from the Geoffrey Ingram Archive of Australia Ballet with permission of the National Library of Australia. Thanks Michelle- this is all of interest. I do have a copy of the 1945 Ballet Crusade. You mention letters from Cuba by Valrene Tweedie – this era I really want to explore – will you give us some insights?? Anne, do you mean the strike that left so many dancers stranded in Cuba? I am very interested in her time in Cuba with Sociedad Pro-Arte Musical de la Habana – circa 1943 and her times in Cuba from ’43 onwards. Another posting, maybe!! Sorry to divert from “Ziggy” briefly – I am really interested in your research here.Thankyou for sharing your knowledge. There is some material about that time in her papers so I will try to put a post together as there are probably others interested.